Build a configuration that fits your environment. Power, filtration and process modules can be installed in a single cluster or connected from a distance to integrate into available space. * The modular design adapts to various configurations and load/unload options. The ValuFlex® Washer was developed with a focus on usability; it provides easy and safe maintenance access, a clear view into the wash and dry process as well as streamlined controls. *Maximum distance and module orientation varies by application. A dynamic fixture positions and rotates the part within a wash halo while a robot-mounted Water Hammer® spray nozzle takes aim at specific holes and features in this thorough cleaning process. A fixture spins the part in an isolated dry chamber while air knives remove moisture, preparing the part for the next manufacturing process. 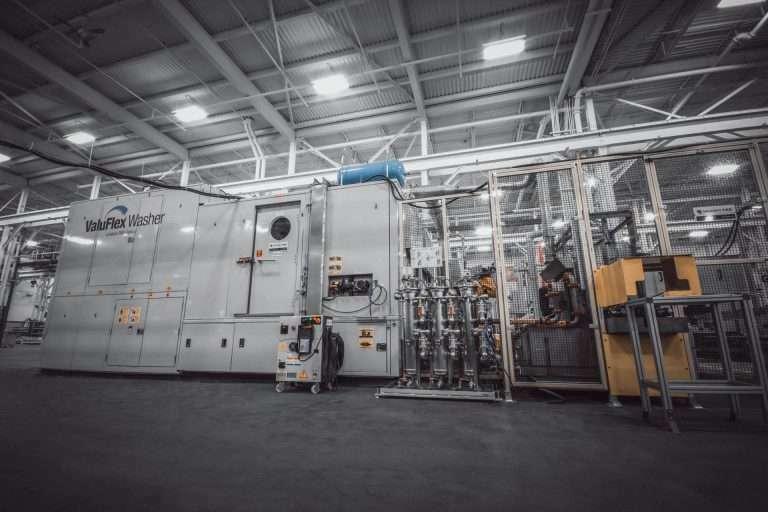 Additional modules such as spin and vacuum dry can be added to achieve specific requirements. Our patented Water Hammer® nozzle technology is the ultimate all-in-one cleaning tool. Equipped with a PLC-controlled spray pattern and optional pulse capability, this nozzle handles general washing and deburring requirements. A robot manipulates the part around a fixed Water Hammer® spray nozzle, targeting specific areas. Additional wash tooling, such as wash halo’s and rotary heads, can be installed to achieve optimal results. 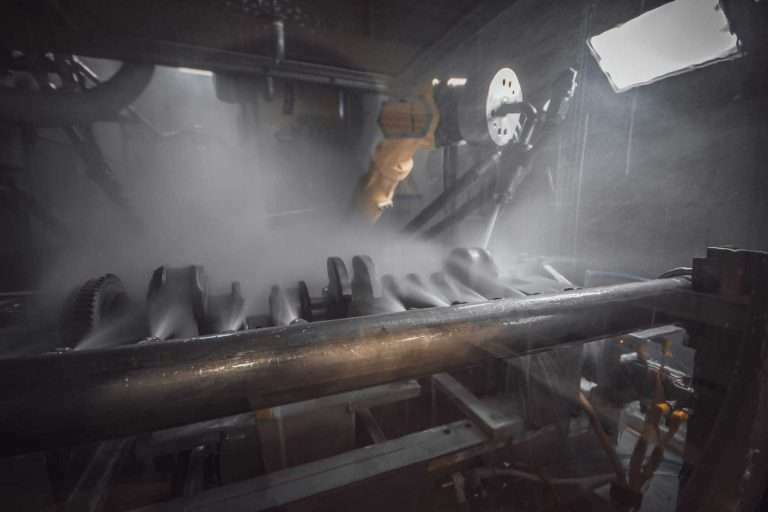 A robot rotates the part to drain excess water before maneuvering it in front of high pressure air knives to remove moisture. Additional drying modules and cooling tunnels can be added to achieve specific results. I3, I4, V6 Block, Head, Crankshaft, Camshaft, Valve Body, Solenoid Body, Transmission Parts, etc. V6, V8, I6 Block, Head, Transmission Case, Converter Housing, etc. V6, V8, I6 Diesel Engine and Transmission Parts, etc.